Treat your cookware to thorough cleaning with the Essteele Powder cleaner. This convenient powder is easy to use and restores your cookware to its original shine. Suitable for use on all stainless steel and copper cookware. Essteele 495gm Powder Cleaner is rated 4.6 out of 5 by 17. Rated 1 out of 5 by Spicko from Infuriating Packaging I've been buying this product for over 10 years. It works well - PROVIDED YOU CAN GET THE WRETCHED THING TO OPEN! I've made numerous complaints about it, and the retail store (Myer) agree that they get lots of feedback about the failure of the cap to UNscrew allowing the powder to come out. I live in regional Australia the store I bought it from is over 400kms away, so no chance of any returns. What can you do for me, and when-o-when are you going to address the woefully sub-standard packaging that you must know exists, yet you've done nothing about it? Rated 5 out of 5 by Susieboots from Best ever! Used to use this years ago and couldn't find where to buy it. Have now resumed my use and it is fantastic - still! 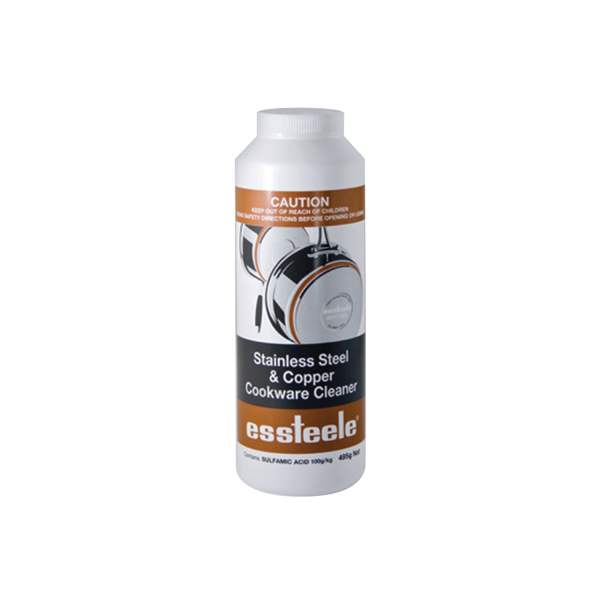 Rated 5 out of 5 by Lois from Esteele Powder Cleaner I have tried other Powder Cleaners for Stainless Steel but Esteele is by far and away the best I have ever used. Rated 5 out of 5 by Mare from Great cleaning powder for Estelle saucepans I have used Estelle saucepans and cleaning powder for over 20 years. It works perfectly and I only wish it would work as well on my non Estelle saucepans!! Steel and copper bottoms , even after burning accidents, come very clean and you only have to remember to dry off with a tea towel rather than air dry, as they can get spotty! Rated 5 out of 5 by Spiribloss from This works! I having been using this product for years and years. The best product for cleaning my SS cookware, SS stove tops, SS kitchen and laundry sinks and even my kettle exterior. I wish it was sold in all the supermarkets again, but Essteele's service is brilliant and I will deefinitely shop with them again. Thank you for such a great product Essteele! Rated 5 out of 5 by Happy from Best ever I've been using this on my Estelle saucepans since I bought them 7 years ago and they still look new.